Help us understand what a paleoanthropologist studies. The target organism is the human being. There are a lot of different stories about how people got here. In fact, in anthropology you learn that every culture in the world has an origins myth, a creation myth. Many people in the Judeo-Christian tradition turn to the Bible and the story of Genesis, and we're all quite familiar with that. Fewer of us are familiar with the Cherokee origins myth, or the Hindu origins myth. But these are all myths. We really only got here one time and one way, and it's easy to tell stories about it, but it's hard to find out how we did get here. That's what paleoanthropology is all about, looking at the evolutionary history of the human species. The human species is a very unusual mammal, it turns out. We have very large brains. We have a unique way of walking around, two legs. And we would like to know how that happened. We have a technology that is overwhelming -- in fact, it's threatening the planet today. We would like to know how that happened. All of these aspects of the biology of people can be pursued in the paleontological record, going into the record of the rocks to try to understand how it is that we arose. This is a complicated business. You're interested in dating what you find, you're interested in the anatomy of things that you find, but you're also interested in the behavior. So you're trying to contextualize and get a broader picture of what you're finding. That's exactly right. We are at the intersection of the biological sciences, the physical sciences, and the social sciences. It's an endeavor that requires the work of a lot of specialists from those different areas. For example, to find out how old a fossil is, we have to use geological layers above and below the fossil. We have to find those layers, sample the layers, take the rock sample into a laboratory, and then analyze it to find out how long it's been since that rock was molten. The way we do that is with a laboratory here in Berkeley, at the Berkeley Geochronology Center. Paul Renne in the Geology [Earth and Planetary Science] Department is the man who is responsible for generating those age estimates, both with a technique called argon-argon dating as well as with paleomagnetic dating. These are specialized techniques in that area. Now, Paul works on rocks, but another group of people here at Cal work on rocks [in a different way]. The late Desmond Clark was instrumental in Paleolithic archeology of Africa. I was able to work with him for twenty years in Ethiopia. His interest was Stone Age people. Stone Age means people before agriculture, before metal, before writing, before history -- prehistoric or Stone Age. His enthusiasm for this subject really, really captured me, and we were able to work together. I'm more from the anatomical side, I'm interested in what the people looked like, and what their capabilities were, in terms of moving around on the landscape. Were they more like us? Were they more like chimpanzees? And so on and so forth. So as an anatomist, I can turn to the anatomy of modern humans as the model, and say, "This is the end point of an evolutionary process. Let's now try to understand how we got this way." The difficulty is that finding the traces of that evolution is really hard, and that's because those traces are so rare. You can only find them in such limited places on the planet. You brought some artifacts which could probably emphasize the point that you made. Show us ... shall we call it the "generic man," the end state ... ? And compare that with the chimpanzee. We can start with today, because if you're going to start anywhere, you want to start where you have the most data, and in the modern world we have a lot of data. We have living animals called chimpanzees, and we have living animals called humans. We can sample their blood, look at their genes, and establish very clearly that they, the chimpanzees, are our closest living relatives. What about when we look at the skeletal anatomy? This is a human being and this is a chimpanzee. You see the chimpanzee has a much more projecting face, a very large canine tooth, a much smaller brain case. The human brain case is about three times larger; our brain is huge. But look what's happened to our face -- it's really reduced. But now I've just made an assumption. I've assumed that the ancestor of these animals was a chimpanzee. That's a really bad assumption, because we have to remember, this organism, the chimpanzee, has an evolutionary history just as long as ours. It's now clear from the biomolecular data that the ancestry of this organism goes back about six million years into the past, and there was a common ancestor of chimpanzees on the one line, and human beings on the other line. And so in six million years, the chimpanzee has been changing and the human has been changing. If we want to find out what that common ancestor was like, and find out what that chain of ancestors is for this modern human, we have to go back into a record that samples time intervals back through time, back to the six-million year mark. That's why the area where we're working in Ethiopia is so important. It's an area where sediments have been accumulating for six million years. The bones of these ancestors -- in this case, it's the humans; we haven't found any chimpanzees yet -- but we've been able to find a succession of human ancestor fossils that goes back into time, six million years into the past. You've been working at this site at Herto, since about 1981. What is it about the geography there, the terrain, that makes it ideal, that these items have been preserved over the years? It's a very special place, the Horn of Africa, and Ethiopia is a very special and really wonderful country. It has a deep history of its own. In fact, it has an Orthodox Christianity in the highlands that goes all the way back to the time of Solomon. It's an amazing place. The whole country of Ethiopia is, in a sense, conditioned by its geography. If you go today to the lowlands, you find Islamic people. In the highlands, the Christian people. Now, let's trace their roots back, let's go back into the prehistory. If we run the clock back, way back, back to 30 million or 40 million years ago, what happened is that the African continent domed up in the region of the Horn. Then the Arabian Peninsula broke free and started to rotate counterclockwise. This opened up the Red Sea and the Gulf of Aden. Then the Somali Plate rotated away from the African continent, and that's opening up the third gulf. It's just not full of seawater yet. That's the Great African Rift that runs down into Kenya and Tanzania. That rifting process, and the doming that came first, creates a basin in Ethiopia. It's called the Afar Depression. Today, when it rains in the highlands of Ethiopia -- and the highlands go up very, very high; even the capital city, Addis Ababa, is about 7,000 feet -- the drainage goes two ways: one goes into the Nile out into the Mediterranean, the other one goes off into the Afar Depression. It's been doing that for millions of years. 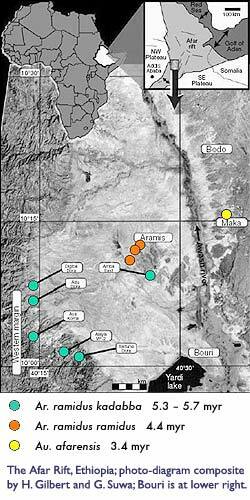 Every rainy season these torrential rains in the highlands drain via the rivers into the Afar Depression, carrying with them silt, mud, and sediment, and forming lakes and rivers. It's a lowland, it's warm -- it's nearly tropical. It's a fantastic place for a game park -- and, in fact, you're sampling what's been a game park for six million years. All the animals that have died have gone into those sediments, have been entombed. The great thing about this place is that it's continually interrupted by these earth movements. They didn't stop. The Arabian Peninsula is still pulling away. As that happens (it happens so slowly we can't see it, except through geological time; it's on the order of centimeters a year that this process occurs) it produces faults -- tectonics -- that displace these old sediment layers, bring them to the surface, [so that] we can walk along a horizon that was deposited in a lake a million years ago, or two million years ago. With our calibration of those layers, suddenly we have a way that we can go back into the past without a time machine. We can let this depression act as our time machine and transport us through time. That's what attracts us to this particular area in Ethiopia. So this area is an opportunity.